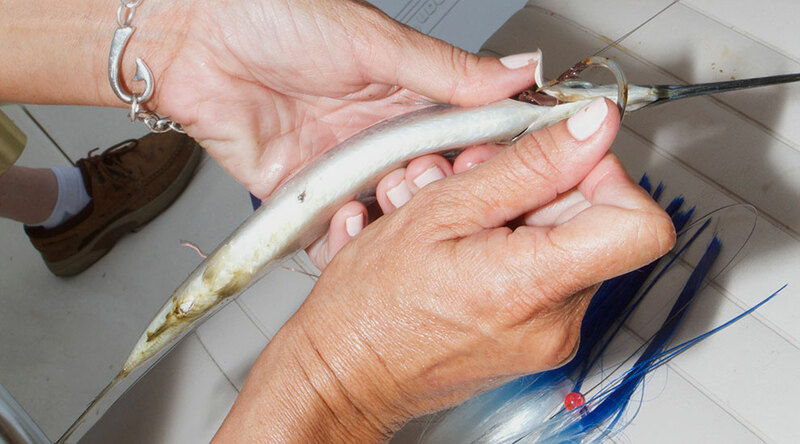 Start by selecting a fresh ballyhoo and remove the entrails by squeezing along the belly of the bait. 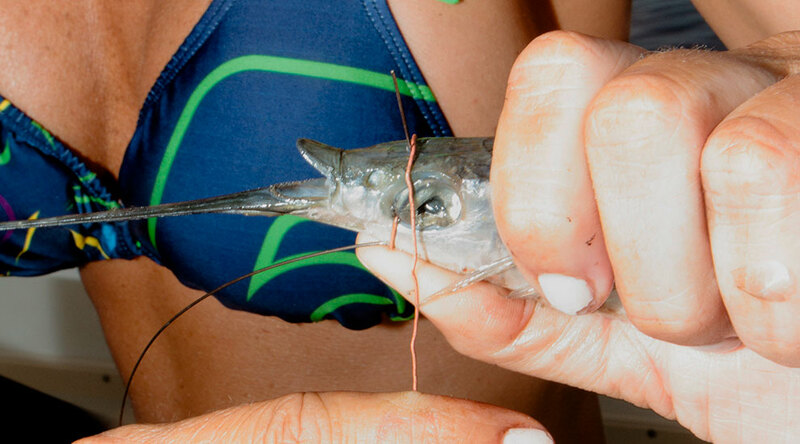 Using wire is a great way to avoid cutoffs from wahoo and king mackerel. 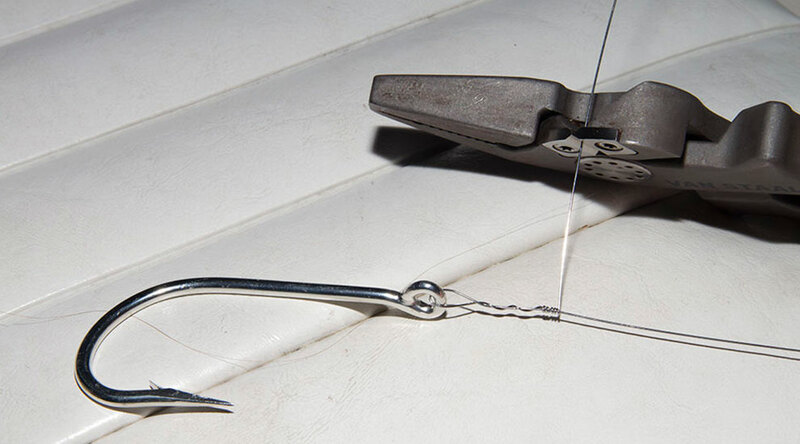 Make a Haywire Twist by forming a loop through the eye of your hook with #8 wire. Take three wide turns with the wire, then make five tight wraps at a 90-degree angle over the standing wire. Break or cut the tag end of the wire leaving a little more than an inch of wire to use as your pin. You can trim the wire to a more exact length once you have the ballyhoo wrapped. Measure where you want the hook to exit the bait by aligning the eye of the hook under the eyes of the bait where the gills split. Pierce the belly of the bait with the point of the hook where you want the hook point to exit. 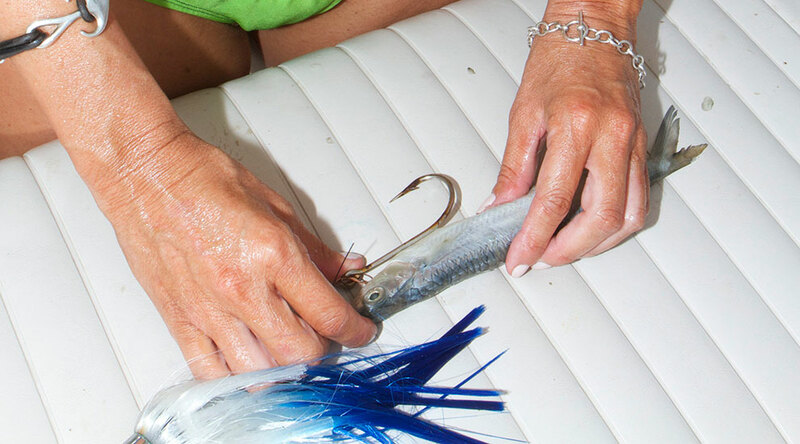 Lift the gill plate with your left thumb and feed the hook into the bait behind the gills. Gently work the hook through the bait until the point exits the hole you made previously in the belly. Attach a length of soft copper rigging wire with a haywire twist. Push the pin (tag end) of your wire leader through the bait's chin and out the top of the bait's head. The pin will help you secure the copper wire used to wrap the bait's mouth shut. 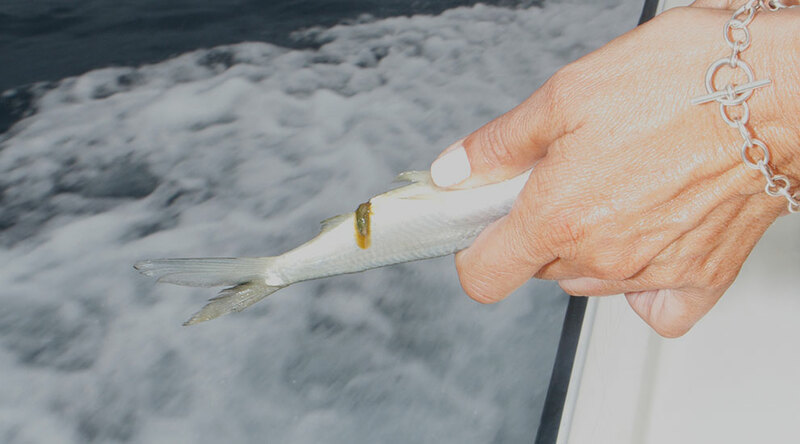 Wrapping the head of the bait will help to prevent the bait from washing out, and the hook from fouling. Thread the soft cooper wire through the bait's eyes and make one wrap behind the wire pin. Continue to make tight wraps with the soft copper wire until the ballyhoo's mouth is secured shut. Secure your wire then break off the bait's beak. Slide your lure down the wire leader so the ballyhoo sits snuggly into the nose cone of the skirt. You can use plastic beads to fine-tune the spacing between the lure and bait. Attach the rig to the swivel on your leader and you're ready to fish.